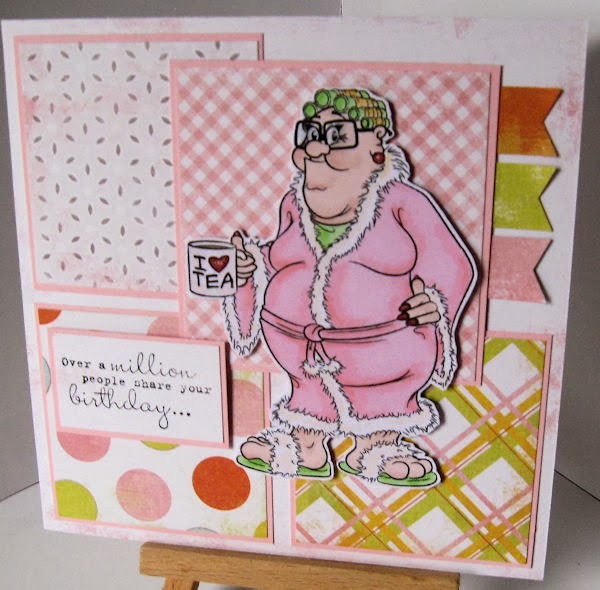 Well it is Wanda's birthday and she has a meal booked for the evening with hubby Walter, however getting ready for an evening out is not a five minute affair so she is starting her day slowly with the prerequisite cup of tea. The curlers are in so her luscious looks will be a sight to behold come the night. You can find Weekend Wanda HERE, you can also find her husband Walter in his weekend attire HERE. By the way inside the card reads 'that means you are one in a million', I think we can safely say Wanda fits that description!! 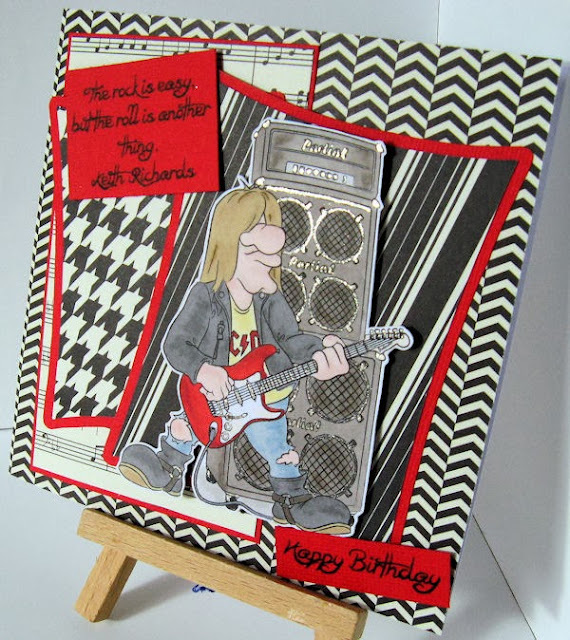 Dr. Digi regular Debbie has got the perfect idea for a 60th birthday present. Though why she's sent Mobility Malcolm to get it is beyond me. 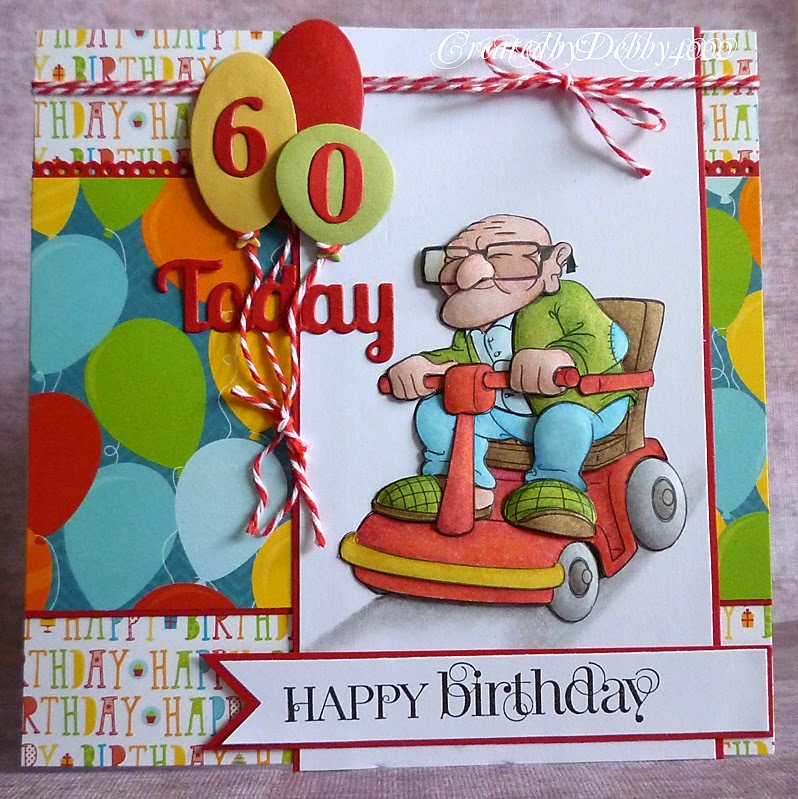 By the time he gets to the shops and back it'll be time for the 61st party. Well, Girl Power is no bad thing especially when it comes to invaders of the space kind. And beating your brothers at their own game is just as good as getting your highest ever score. Player One is available in the store along with the Invader Dots backing papers. 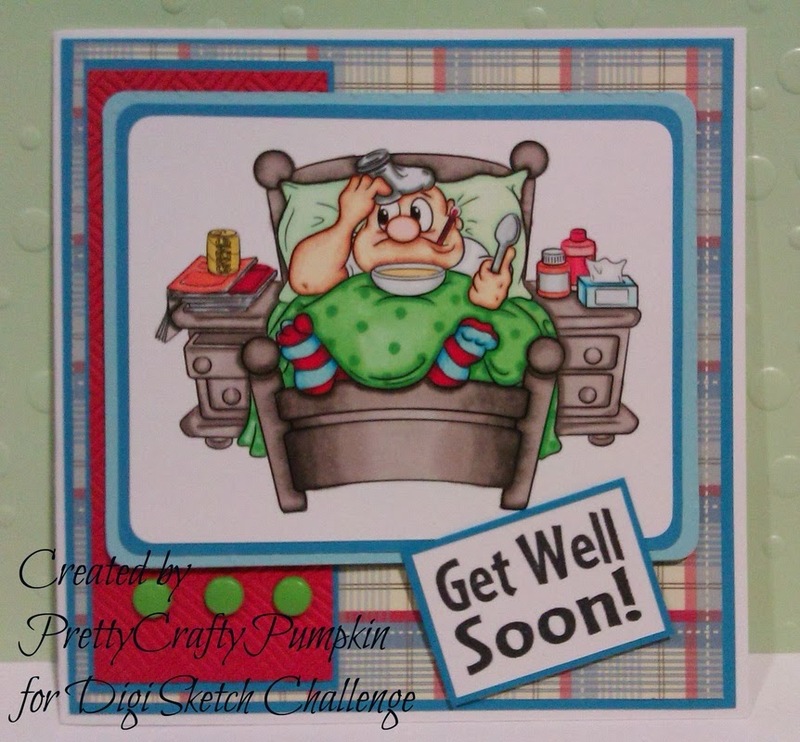 Really, is there anything more pitiful than a sick man? 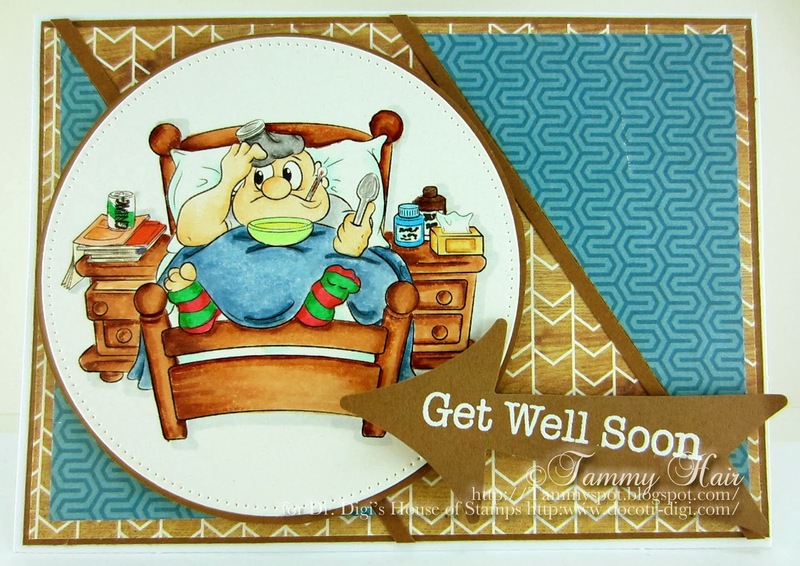 Yes, if that man happens to be Man Flu from Dr. Digi's House of Stamps! But no fear, Man Flu is only suffering from over indulgence of the fruit of the vine and not with the ailment that's he's convinced he has! Every now and then life seems to interfere with the smooth running of our day to day activities. At this point we all need a Tea Trolley Dolly, she'll dispense that golden goodness and things will look a little brighter. Throw in a sticky bun as well and you'll definitely be able to see the light at the end of the tunnel. If, heaven forfend, you are not a tea drinker, I'm sure Dolly will have some coffee stashed away somewhere. You can find Tea Trolley Dolly HERE and also the individual tea mugs HERE. 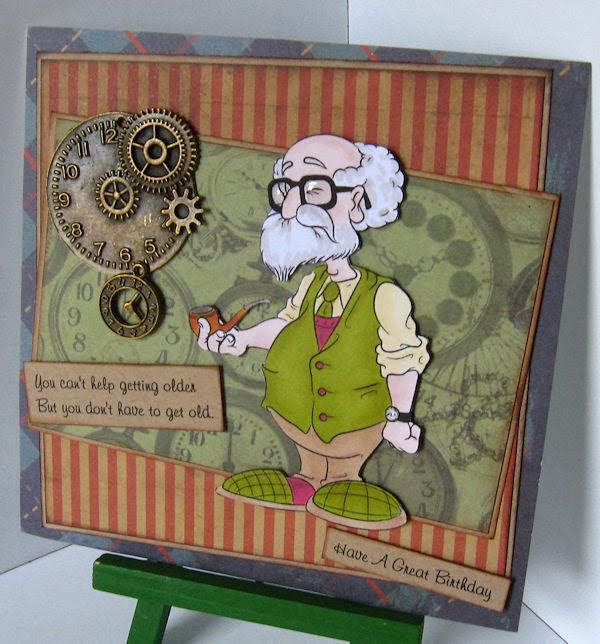 Betina has made everyone's favorite down trodden husband, Derek Dunderton, into a Fantastic bookmark. Which is pretty apropriate as Derek is always escaping into a book in the shed. Now I must admit that I do have a soft spot for this particular digi - Flossy - as it is so easy to work with. 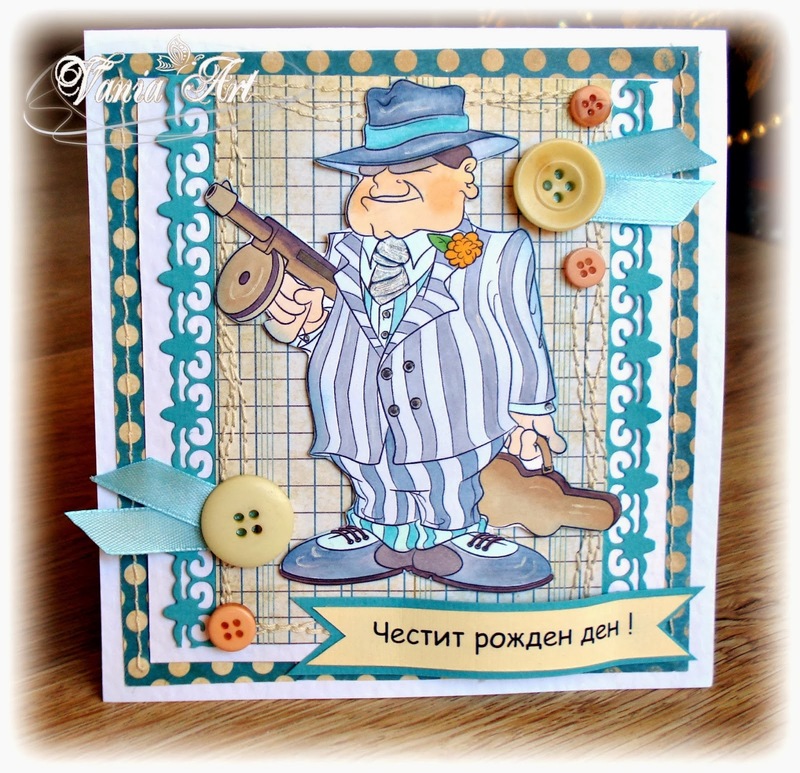 Plus I can use all the woolly puns I can think of, including the one on this card! And just perfect to make a leaving card! 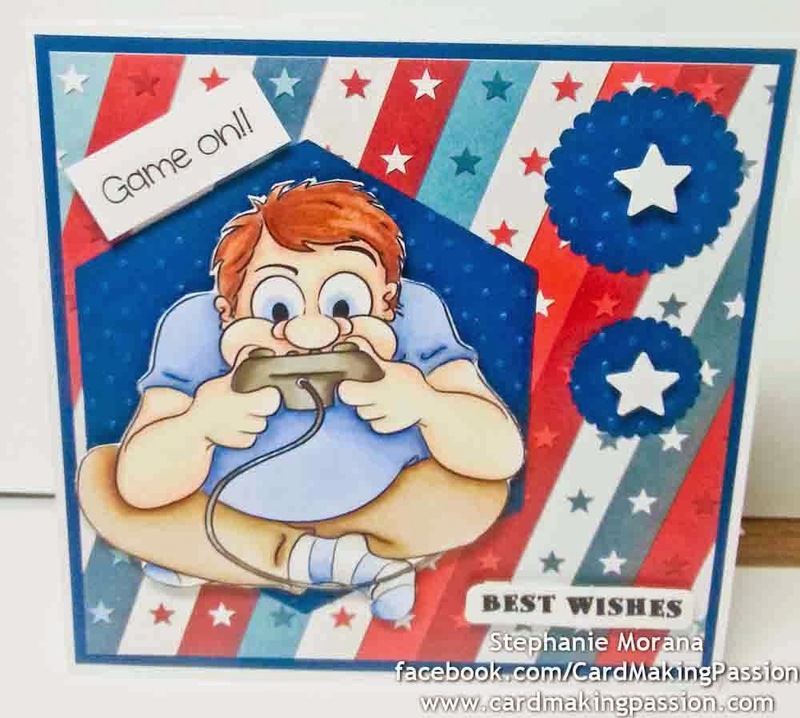 Stephanie has got her game on with High Score Hugh and at just £1 you cant blame her. 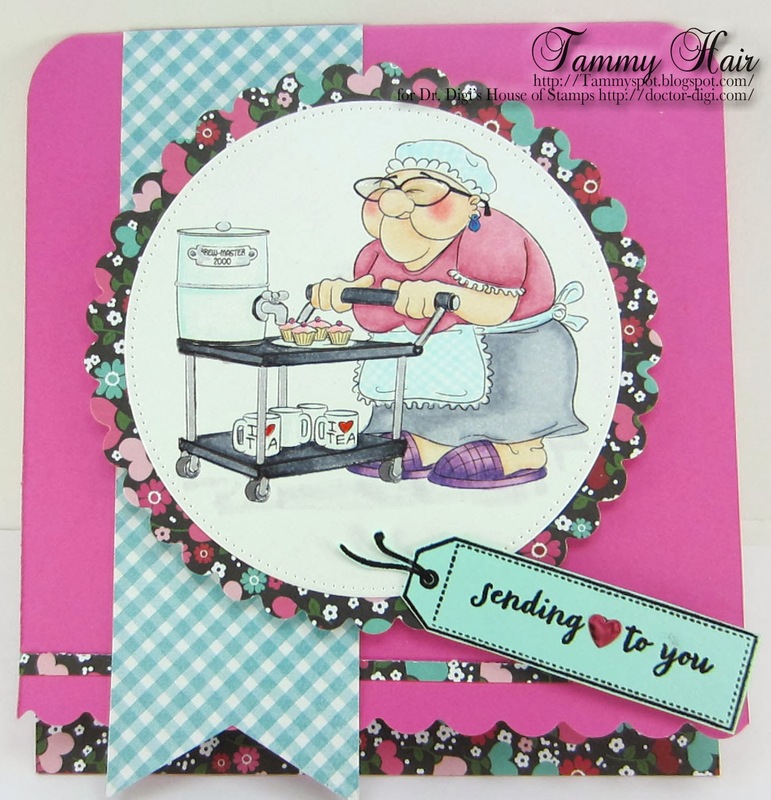 Meet Tea Trolly Dolly, one of the new images available at Dr. Digi's House of Stamps! 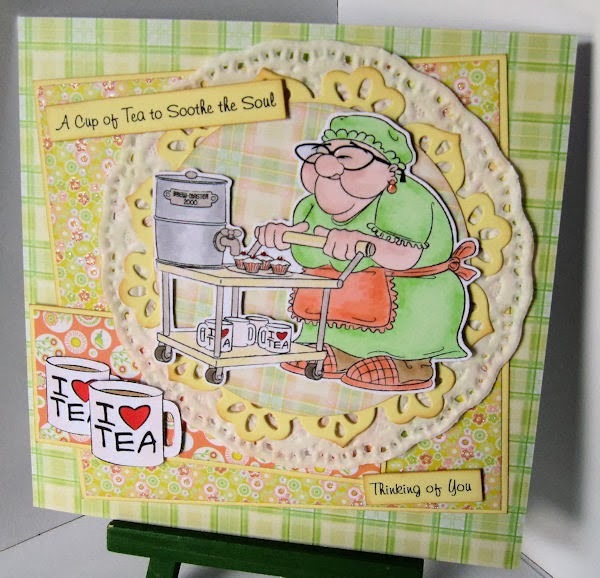 The darling sweet grandmotherly type, is really serving cold beer in her Brew Master 2000, but don't tell the boss! Everyone loves her, just don't order one of her stale cupcakes! Time's running out if you want to apply for Dr. Digi's design team. 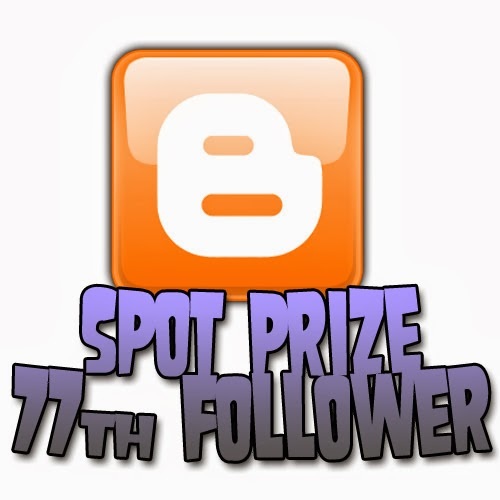 We've had some fantastic crafters apply and we'll be letting you all know who the team picked in the next newsletter. 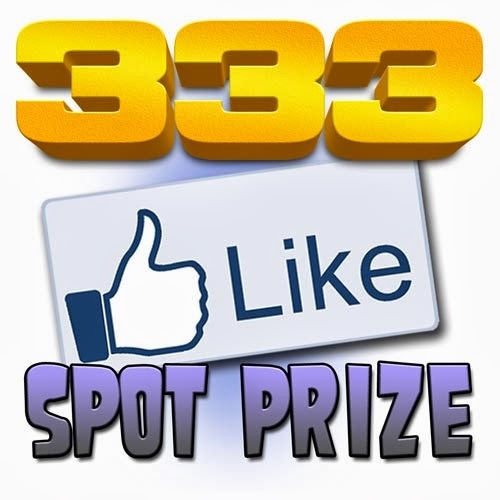 So you have till next sunday to mail us at doctordigi@doctor-digi.com with a link to your blog and try your luck. Time passes for us all, let's face it the only certainties in life are death and taxes, but it's what you make of your time on this fair planet that counts. Ambrose Dunderton, a long term fan of George Burns, embraces the quote 'You can't help getting older, but you don't have to get old', something some of the oldies who block the aisles in my local supermarket, bemoaning their ailments, could do with listening to! Debbie has called in Dunderton Decorators to do the birthday decorations for this fantastic card. When you've got a job this big, it always pays to call in the professionals. Here are a few of the finest Dr Digi images to furnish a retirement scene - coffee table, armchair (with drapery removed) and lamp. Plus little references to the recipient. The cd stacks and Ipod docking thing are my own creations. Bit of a strange juxtaposition when you think about it! 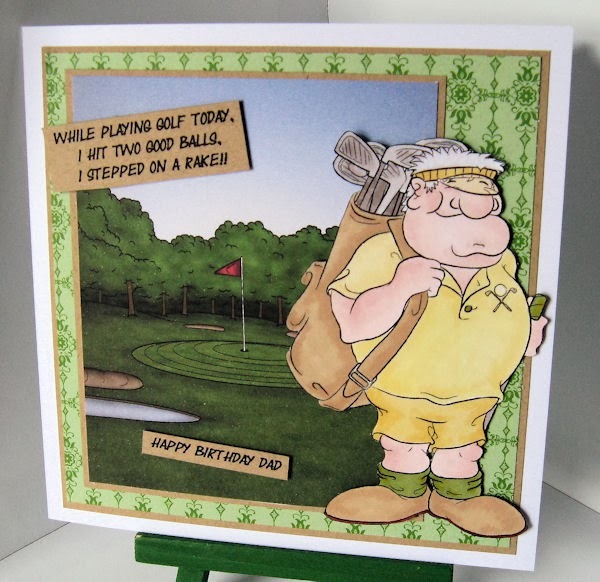 Now this card should have been posted on Friday but Hal took a lot longer going around the golf course than had been anticipated, now we can see why, he spent a large part of the time curled up in a tight ball on the fifth green! However he is none the worse for his adventures and is now off to the 19th hole for a refreshing glass of beer and an ice pack. 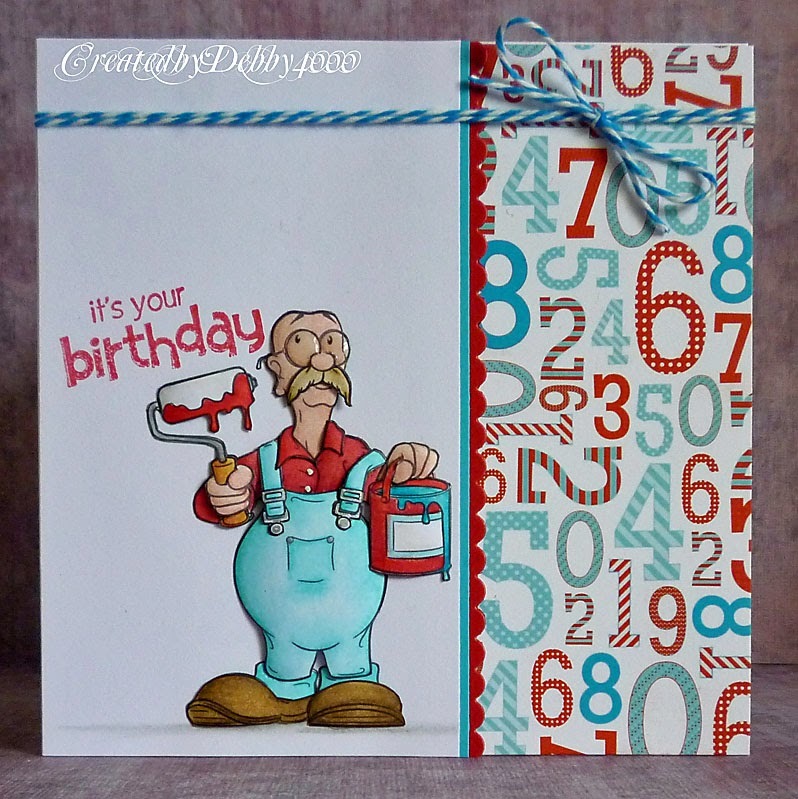 And the winner is (drumroll please) Player One from Dr. Digi's House of Stamps! But we all knew the come out come last week. The bad news is that Player Two cannot return to work for several weeks because of a severe case of strained thumbs! and we'll see if you've got what it takes. Good Luck! It's always sad when we lose a DT member, but it's always nice when you get a little reminder that they're still out there crafting. 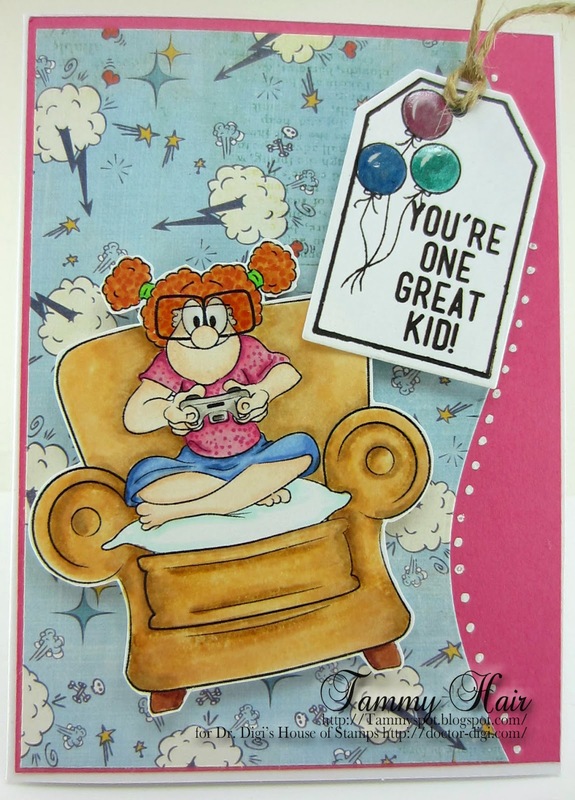 Especially when they're making fab cards with your stamps. That's why Janey's card with Airfresh Fiona especially made us smile. Mr Speaker is certainly giving it his all - to wish a lucky recipient a Happy Birthday! Happy New Year, have a prize! 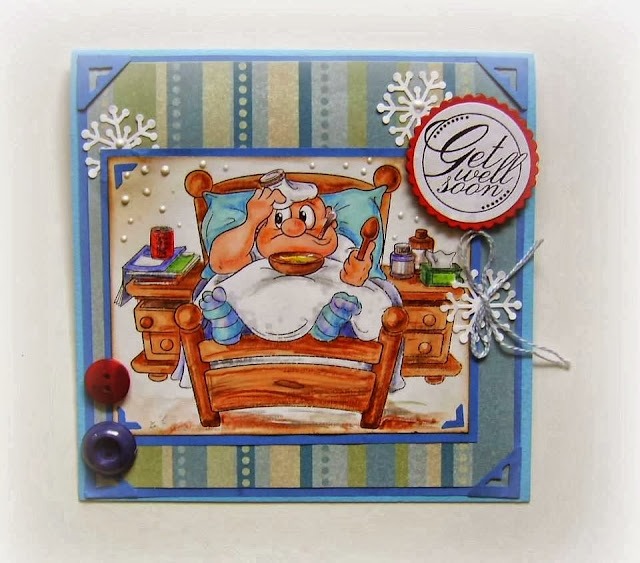 Since Santa shimmied down the chimney and left a new game, Player Two from Dr. Digi's House of Stamps has diligently been trying to beat someone, anyone! Now he is playing against the youngest child in the neighborhood and from the looks on their faces, I'd say he's about to lose another game! I know that you are all looking forward to the summer hols, so to take your mind off the cold and possible snow?? Here is Ambrose king of the waves, all set for his summer hols. I hope the hangovers are receding and wish you all the best for 2014. The new year unfortunately means some new starts. Mandz will be making her last post on the 4th. I'm sure you'll all wish her well. So as it's a new year we're going to try something different. Our first design team call.